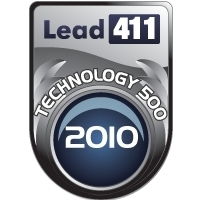 Lead411 announced today the final rankings of its Technology 500 list of the fastest growing tech companies in the US. Pontiflex Inc. was at the top of the list. We started this list to in order to track and recognize the fastest growing tech startups, and Pontiflex epitomizes this growth. Lead411 announced today the final rankings of its Technology 500 list of the fastest growing tech companies in the US. Pontiflex Inc, the industry's leading e-mail and social acquisition platform, topped the list, thanks in part to its astronomical revenue growth, which reached $6 million in 2009, and projected to hit $15 million in 2010. Pontiflex's patent-pending technology makes advertising relevant by connecting people to the brands that matter to them. Pontiflex’s signup ads enable people to sign up for ads without leaving the website or mobile app. Advertisers only pay for signups -- the actual data from people who have chosen to hear from them. Lead411 provides news, alerts and people data on U.S. based companies., as well as stays on top of trends in the technology industry. Lead411 compiles its data into lists of the top tech companies geographically. Other companies on the list include Scale Computing; Collections Marketing Center and accesso, LLC. To view the entire Technology 500 list, click here. Lead411 was founded in 2001 and has grown 40% yearly since inception without accepting venture capital financing. We are based in California, but have satellite offices in New York. In addition to our current subscriptions, we also offer corporate information, company news and awards for up-and-coming businesses. We plan to add on additional services and companies in the near future. For more information visit http://www.lead411.com.